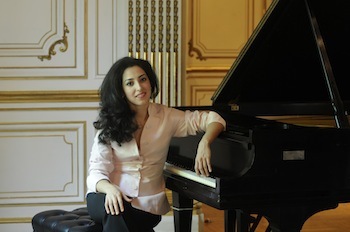 Sara Daneshpour showed a bunch of impressive skills during her piano recital at the Phillips Collection on Sunday, but the one that lingered longest in the memory was her way with an intense, slow melody. By instinct or sheer concentration, she creates moments when time seems to stop and the brief pause between notes feels interminable as you wait for what happens next, even in works you know well. I think that's the same top we saw on Sunday. From her site. In the slow movement of Franz Joseph Haydn’s Sonata no. 38 in F major (Hob. XVI:23), which dives unexpectedly into deep sadness after a sturdy, echt-Haydn Moderato opener, the chromatic notes in the melody induced shivers; they felt like chokes in someone’s breath, aches as the line moved downward on the keyboard. In the Chorale section of César Franck’s Prelude, Chorale, and Fugue, she de-emphasized Franck’s filigree around the notes to ensure that the chorale itself blossomed, unexpectedly solemn and meaningful in this virtuoso showpiece. And in Sergei Prokofiev’s Sonata no. 7 in B-flat major, the Andante caloroso, her playing embodied the “warm” tempo direction — irresistibly golden in tone and yet wracked with grief, at a few points evoking distant bells with her tone and touch in a way that made you lean forward in your seat in the hopes of getting a little closer to the music. Of course, Daneshpour has a bunch of other talents too. She found just the right touch for the first movement of the Haydn, direct and energetic, finishing her trills with flourishes and enjoying Haydn’s sudden contrasts and unexpected turns. Unfortunately, in the finale of the Haydn, she seemed a bit unsure where she was going at times. No such caveats for the ending of the Franck; the pileup of superimposed themes can rarely have sounded so felicitous as it did in her hands, with each line emerging from the thick chords. During a post-concert discussion, Daneshpour emphasized the need for emotional concentration in the Franck, saying “the technical stuff, anyone can do that,” which drew a big laugh from the audience. But because she has the chops, she’s able to make the Franck sing, and the concentration was indeed impressive, especially in a work that tries to be thematically unified but normally sounds more than a little episodic to me. The hectoring opening chords of the Prokofiev sonata came down like sledgehammers in Daneshpour’s performance, but her tone never became ugly, just sort of strategically less pretty, and she had the rhythms of Prokofiev’s sarcasm in her bones. The first movement’s sudden shifts to a barren, dissonant landscape felt organic, and the third movement’s relentless, percussive motion eventually acquired a desperate quality befitting a wartime work, with Daneshpour’s stamina never flagging. Daneshpour threw in two Tchaikovsky miniatures to lighten the mood between the Franck and the Prokofiev, but the program still clocked in at about an hour. The brevity of the program only made it that much more intense. When remembering the weather on Sunday afternoon, I can hardly compliment this recital more than to say it made spending some time indoors worthwhile. In the question-and-answer session mentioned above, we began with questions from Caroline Mousset, the Phillips music director. These displayed the erudition one might expect from a music director in a format unsuited to such erudition — they would begin with a few sentences of history and then gradually work around to an actual inquiry. I had trouble following them, and Daneshpour did not appear to worry herself too much about answering the actual inquiry, merely picking up the last few words and going, which worked fine. The audience questions were unusually high-quality, for post-classical-concert Q&As. I’m going to have to do a blog post on these strange animals sometime. Mousset’s questions may have been especially meaty to make up for the lack of program notes provided. I certainly like reading program notes, perhaps unnaturally so, and was slightly disappointed at their absence on Sunday, but these things happen. I do wish the program listing had provided the Arabic-numeral number of the Haydn sonata in addition to the Hoboken catalogue number. Someone on Greg Sandow’s blog was kind enough to explain to me why there are two sets of numbers, but the fact remains that it’s harder to remember a random mix of Roman and Arabic numbers with a colon in there. I feel that all the Haydn scholars should be locked in a room until they figure out a solution to this, after which we should all adopt it and be done with this nonsense. It was tough being inside and knowing that Dupont Circle was packed with bustling city life (including girls in fresh-out-of-storage sundresses), but being in an oaken room hung with masterpieces including not one, but two Picassos sure made it easier. Everyone in the DMV who likes classical music should make it down to the Phillips once in a while. Somewhere in here I should probably note that I’ve met Sara Daneshpour socially (i.e., at a bar) one time. She’s a nice person. I assume she saw me sitting in the press seats, not that she probably can play any better just because she knows someone’s going to write about it. Pink Martini put on a good show Thursday night in the Kennedy Center Concert Hall. The group was without regular lead vocalist China Forbes, whose doctor had advised her not to further strain damaged vocal chords by performing, and some ragged episodes resulted. But Storm Large (yes, that is a performer’s name and not a Weather Channel alert) subbed in with an imperious diva approach, a big, powerful voice, and total commitment to every song she sang. That went well with the showy sound leader/pianist Thomas Lauderdale and the rest the band adopted for its ritzy surroundings; swinging hard from a solid rhythmic base, songs in Croatian, French, Spanish, and even our native tongue were tough to resist. Somewhere behind the band sat the National Symphony Orchestra, under the direction of next season’s NSO Pops principal conductor Steven Reineke, playing at near-constant volume to accommodate their guests’ amplification, providing a certain sweep to a sound that did not actually need it. That’s the thing about pops concerts: They take place in halls mostly devoted to classical music, and they involve musicians who mostly play classical music, but they treat the orchestra as anonymous color, not as an equal partner. This last was sung by Ari Shapiro, who may be familiar as National Public Radio’s White House correspondent, and who has a lovely voice but uses it a bit blandly for my tastes (at least when singing). NPR’s Scott Simon also made a stage appearance, dragged out of the crowd to intone Turkish phrases during another song, which he proved unwilling to do, although he enjoyed the stage. These two features showed the band’s interest in what I think of as “federal Washington,” along with frequent nods to budget work and Congress that eventually culminated in Rep. Earl Blumenauer (D-Portland, Ore, same as the band) and his staff appearing on stage for the grand finale, Blumenauer gamely shaking his maracas. I depend on federal Washington for a living, and I realize the band’s aesthetic is rooted in the 40s and 50s, but it would have warmed my heart to hear a go-go rhythm tapped out on their well-used conga set as well, although I was likely the only person in the audience to think of that. A while ago, Anne Midgette asked whether pops concerts are a resource for developing new audiences or presentng different kinds of concerts. Concerts like Thursday’s are not going to do that; the NSO got love, but very little chance to show what it, and the music it plays, can really do. It would be fun if there were an occasional pops concert devoted entirely to ear candy like Borodin’s Overture and Polovtsian Dances (when was the last time you saw that on an orchestra program? ), and that might develop an audience for the harder stuff. But when the NSO plays in a show like this, all it does is show Pink Martini’s audience a group that’s really good at playing second fiddle. That’s still a fun night out with a good band, just not the one whose name is at the top of the Playbill. Note: I apologize for how late this review is. I ended up having a root canal yesterday. This year, the Baltimore Symphony and music director Marin Alsop scheduled four “Off the Cuff” concerts, which experiment with mixing music and words to create something with more context than the usual program notes can provide. Friday’s concert at the Music Center at Strathmore had Sergei Prokofiev’s Cinderella Suite as its centerpiece. Alsop gave about 15 minutes of biography and musical examples before ceding the microphone to four undergrads from Johns Hopkins University, who took turns reciting parts of their own retellings of the Cinderella story. Alsop and the BSO then traded selections with the writers as the evening progressed. Alsop and the BSO typically do really well when the music they play calls for color and fantasy, as the suite’s Introduction showed, full of lively and well-shaped melodies and luxuriant sounds. But then each of the writers read the first several sentences of his or her take on Cinderella, enough to get an idea of the setting and character’s names, and by the time the BSO came back for the Pas de Châle the mood created in the Introduction had dissipated completely. 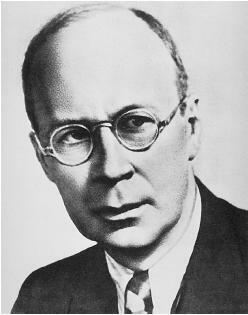 It didn’t help that the writers did not interpret the Cinderella story as eloquently as Prokofiev did. Each has a different background and drew on it to re-imagine the story: Doyeun Kim set her tale in 1800s Korea, Sophi Glazycheva in 1890s Russia, Ana Giraldo-Wingler in modern-day Bogota, and Akif Saifi in an unnamed Middle Eastern city that sounded an awful lot like Dubai. The students clearly have some talent, but they have not yet learned to discipline it; I found myself mentally deleting unnecessary words and correcting usage errors while they read. (One example of a sentence in need of editing: “Thinly veiled Communism seized his company.” Quick! Someone arrest that ideology! I hope we can still pick it out of the lineup while it’s wearing that veil! Another described two sisters eating the best meal “their bellies had ever had the pleasure of enjoying.” Most of the words in that sentence are unnecessary.) Saifi read his text confidently, but the others spent some time stumbling over their own words, which didn’t help. So not all the ingredients in this concert were up to snuff. I also question the recipe. Prokofiev’s score is extremely European, right down the middle of Western Tradition Road, and no sidebar commentary is going to change the images it evokes in listeners’ heads, although the pauses did prevent those images from cohering into their own musical narrative. (Although the concert was advertised as providing a multicultural perspective on the Cinderella tale, the audience Friday night was the normal Caucasian monoculture.) The other narratives were fractured too — we didn’t hear all of anyone’s tale, just the beginning and end, plus a selection of interstitial plot development, presumably to ensure that the concert ended at a reasonable hour. It all led to confusion, not illumination. If orchestras don’t explore new ideas for presenting their concerts, as the BSO is doing with these “Off the Cuff” concerts, they’re never going to figure out how to get audiences packed into the hall and buzzing with anticipation, which happens all too infrequently. A part of this process is trying ideas that don’t work, and so I’m fine with the BSO having tried this. I do wish I could hear Alsop and the BSO perform the Cinderella Suite straight through, though, because that could be part of an excellent night at the symphony. You are currently browsing the DMV Classical weblog archives for April 2011.